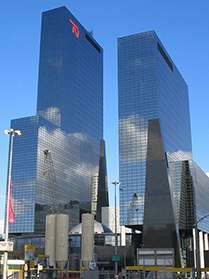 The construction of a rain radar has started on the roof of the Nationale Nederlanden building in Rotterdam. This will yield a very accurate picture of precipitation patterns in the city and thus help prevent flooding and water damage. The project is being supported financially by the City of Rotterdam, the Province of Zuid-Holland and the European Union. The rain radar, which is currently being built in Rotterdam, specialises in measuring local precipitation. The radar will make it possible to measure precipitation patterns in the city much more accurately and, as such, facilitate improvements in the quality and efficiency of the city's water management. Possible applications for the data include the intelligent control of pumping stations, the use of water storage (such as the water squares) and local weather reports. Noordwijk-based SSBV Aerospace & Technology Group is supplying the rain radar, which is expected to be completed and used for the first time in November 2013. For the best possible observations and registration, the rain radar must be placed as high as possible and will therefore be located on top of the Nationale Nederlanden office building at the Delftse Poort twin-tower skyscraper complex. The owner of the Delftse Poort building is providing the location on the roof of the office building on Weena at no cost. And the tenant, Nationale Nederlanden, will be providing the electricity needed to power the radar, also free of charge. The Rotterdam rain radar forms part of the wide-ranging European RainGain project, in which four universities – Imperial College London, École des Ponts ParisTech, KU Leuven and TU Delft – are working together with other parties for four years on implementation of a new type of rain radar. A subsidy of 3.6 million euros is available for the entire European project, which is being financed via the INTERREG IVB North-West Europe Programme. Rain radars are the only measuring instruments that can provide precipitation measurements on the necessary time and space scales that are required for this purpose. Only recently has this technology been developed to the detailed level needed for urban areas. Spaceborne precipitation radar ships from Japan to U.S.